A description of what was covered at this past clinic is below the upcoming clinics. Within 250 miles of Saint Paul, MN. Search all of our clinics at our find a clinic page. ***These sessions have SOLD OUT. Enter the waitlist for this clinic by clicking register. We will likely be back this winter! CLICK HERE to be among the first to register. Kicking: Your legs generate a huge amount of power in each stroke. Being able to have fast and effective kicks all depends on your technique. Nick Thoman, Giles Smith, and Kierra Smith will help participants learn how to improve their breaststroke, flutter, and dolphin kicks for faster racing in all four strokes! Underwater Dolphin Kicking: Absolutely, undeniably, the fastest way to move through the water! Whether you dolphin kick on your stomach, side or back, understanding the importance of streamlined, underwater speed is vital for every swimmer! Let our Olympian clinicians teach you how to make the most of your streamline and underwater kicking, as well as teach you drills on how to improve upon those skills. Kicking: Your legs generate a huge amount of power in each stroke. Being able to have fast and effective kicks all depends on your technique. Nick Thoman will help participants learn how to improve their breaststroke, flutter, and dolphin kicks for faster racing in all four strokes! Breakouts: It is SO important to be able to take the speed off of each wall and carry it into your swimming. Learn how to explode into your breakout with a streamlined and powerful first stroke. Efficiency is key in learning the optimal breakout technique. Finishes: The key to winning close races is proper finishing technique. Accelerate into the wall keeping your head down and your strokes long. Nick will help all swimmers learn how to get their hand on the wall FIRST. Kicking: Your legs are capable of generating a huge amount of power and it is imperative to utilize this power in all 4 strokes. Being able to maximize the effectiveness of your kick comes from strength, flexibility, and most importantly technique. Nick Thoman will help participants learn how to improve their breaststroke, flutter, and dolphin kicks so that you can drop time in every event! Underwater Dolphin Kicking: The fastest swimmers in the world dolphin kick off of their walls and they are fast at it. Nick will help swimmers learn how to use their frequency and amplitude from each kick to get more speed and power in their underwaters before breaking out into an explosive first stroke. IM TRANSITIONS (The Crossover Turn): In this clinic you will learn the intricacies of how to get in and out of the flags faster than ever in your back to breast turn (also called the crossover turn). It may require toughness, coordination, and focus but it will pay off! Nick will talk you through what he thinks about to be one of the fastest swimmers in the world at the turn! 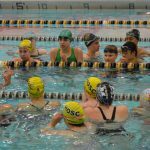 ASK QUESTIONS: Swimmers and parents are invited to ask Nick Thoman, Kierra Smith, and Giles Smith questions during a Q&A session. Gain insight into their training regimen, diet and nutrition, and recovery tactics. Get to know them and relate to their journey as inspiration for yourself. WATCH THE CLINICIAN: Observe Nick Thoman, Giles Smith, and Kierra Smith swim at full speed and demonstrate a progression of perfectly executed drills to achieve powerful, efficient and fast swimming. Visual learners will greatly benefit from not only seeing drills done correctly, but also from seeing them live and in person! 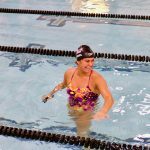 PRACTICE DRILLS: Learn the same drills that Nick, Giles, and Kierra practice every day as well as what they thinks about when they swim. Then get the chance to practice them and get feedback! Take a photo while wearing clinicians' medals, get autographs, and recieve a special gift from our sponsors! Inquisitive, Educated Swimmers are Faster Swimmers! Sign up TODAY! Can't find an upcoming clinic in your area? Subscribe to our emails to get updates on when we come to town. Copyright © 2018 Fitter and Faster. All rights reserved. What would you like to do with Fitter and Faster and/or any of the athletes on the clinic tour? How would your involvement benefit participants? What would you like participants to learn? Do you have a facility in mind? Is there a rental fee?